What if the unwed mother gets married subsequently to the biological father? Is the adoptee’s right to inherit from both the adoptive and biological parents under the Family Code no longer true under RA 8552? What about adoption by a wife and husband (one a former Filipino citizen and the other a natural-born citizen of another country)? The Philippines has two laws on adoption, namely, (1) Republic Act 8552 Domestic Adoption Act of 1998; and (2) Republic Act 8043 Inter-Country Adoption Act of 1995. Portions of both laws have been amended by RA 9523 as I will discuss below. RA 8552 amended Articles 183 up to 193 of the Family Code of the Philippines (FC) and is the governing law for Filipino citizens adopting other Filipinos (whether relatives or strangers), with some exceptions. Under Article 192 of the FC, the adopting couple may, under certain circumstances, ask for judicial rescission of the adoption. Rescission of adoption is no longer allowed under RA 8552. RA 8043, on the other hand, governs the adoption of Filipinos by foreigners and is implemented by the Inter-Country Adoption Board. For more information on inter-country adoption, please surf to the websites of the ICAB and the Filipino Adoptees Network. RA 8552 (and not RA 8043) applies when a foreigner who is married to a Filipino citizen seeks to adopt jointly with his/her spouse a relative within the fourth degree of consanguinity or affinity of the Filipino spouse. Adoption is a legal process while simulation of birth is an illegal practice resorted to by a lot of Filipinos. Adoption is the legal process by which a child becomes the legitimate child of the adopting person/s. Simulation of birth on the other hand occurs when a childless couple, for example, comes into possession of a baby or child, given to them by a midwife, an unwed mother or a relative, and this couple then applies for a birth certificate, making it appear that the baby or child is their biological offspring. Under RA 8552, simulation of birth is a criminal offense punishable by eight years imprisonment and a fine of fifty thousand pesos. 1. A lawyer prepares the petition for the person or persons wanting to adopt. The petition includes documents like birth certificates, marriage certificate, proof of financial capacity (like ITR, bank deposit, etc), clearances (barangay, police, NBI, fiscal, court), and others as proof of good moral character, good health, etc. 2. Upon payment of the filing or docket fee, the petition is raffled to a Family Court (of the city nearest the place where the petitioner resides). If the petition is sufficient in form and substance, the court issues an order, usually within a month after the filing of the petition, setting the case for initial hearing and ordering the court social worker to conduct a case study and home visit. 3. The court order is published in a newspaper of general circulation once a week for three weeks. The newspaper is chosen by raffle conducted by the Office of the Clerk of Court, in compliance with a Supreme Court circular. If a small time newspaper wins in the raffle, the total cost for the publication could be as low as Php 7,000. But if a big time newspaper like the Bulletin or the Inquirer wins the raffle, the total cost could be as high as Php 50,000. 4. Before the initial hearing, the social worker conducts a case study and home visit. The social worker submits his investigation report and recommendations to the court before the initial hearing. 5. On the date of the initial hearing, the petitioner and the prospective adoptee must be present. The lawyer presents what are known as the jurisdictional facts (petition, proof of publication in newspaper, notice to the Office of the Solicitor General, etc). 6. If there is no opposition to the petition for adoption by any party, then the lawyer asks the court permission for an ex-parte presentation of evidence, done before only the court stenographer and the court appointed commissioner (the branch clerk of court). The court however can require presentation of evidence in open court. All in all, the case could take up to about a year to finish. 7. If the court decision is favorable and there is no appeal by any party, then the court issues a Certificate of Finality. The lawyer then coordinates with the Local Civil Registrar (of the town or city where the court is located, and the adoptee’s birthplace) and the National Statistics Office for the issuance of a new birth certificate bearing the petitioner’s surname. Legally speaking, the relationship between any unwed mother and her child is illegitimate. In order to legitimize the relationship between an unwed mother and the illegitimate child, the mother must file a petition under RA 8552, our domestic adoption law. Section 9, paragraph (b) of RA 8552 states that the written consent of the biological parent/s is necessary. UP College of Law professor Danilo L. Concepcion in his article “Domestic Adoption: Law and Procedure” (IBP Journal, March 2009, Vol. 34, No. 1) states that the reason why RA 8552 requires such consent is that their parental authority over child (the prospective adoptee) will be terminated. Several women have e-mailed about this situation. Either they do not know where the biological father of their illegitimate children is or the father is making things difficult for them. One woman even told me that the biological father asked her for money in exchange for his written consent. Prof. Concepcion argues (and I agree with him) that because an illegitimate child is under the sole parental authority of the mother under Article 176 of the Family Code, then the consent of the biological father is not necessary. Prof. Concepcion states that the problem is with the wording of the law. He says that, instead of “biological parent/s,” the law should have used “legal parent/s” instead. (iii) if the spouses are legally separated from each other. In case husband and wife jointly adopt, or one spouse adopts the illegitimate son/daughter of the other, joint parental authority shall be exercised by the spouses. The mandatory requirement is in consonance with the concept of joint parental authority over the child, which is the ideal situation. 7 As the child to be adopted is elevated to the level of a legitimate child, it is but natural to require the spouses to adopt jointly. The rule also insures harmony between the spouses. Sec. 18. Succession. — In legal and intestate succession, the adopter(s) and the adoptee shall have reciprocal rights of succession without distinction from legitimate filiation. However, if the adoptee and his/her biological parent(s) had left a will, the law on testamentary succession shall govern. It seems therefore that the right of an adopted child to inherit from both biological and adoptive parents under the Family Code has been repealed by RA 8552. But, in law, implied repeals are frowned upon. Thus, it may be argued that Article 189 of the Family Code is still good law. For issues regarding succession (“inheritance” in layman’s term) and adoption under RA 8552, please read “Revisiting the Philippine Laws on Adoption: Issues on Succession” from the Ateneo Law Journal. Please also read the article on domestic adoption by UP Prof. Concepcion which I mentioned above. Prof. Concepcion holds the same view I have that those provisions of the Family Code that have not been expressly repealed by RA 8552 are still applicable. The Family Code allowed adoptive parents to apply for judicial rescission or revocation of the decree of adoption. For the child’s best interest, however, RA 8552 no longer allows rescission by the adoptive parents. Only the adopted child can ask for the revocation of the adoption. What if the adopted child becomes wayward morally or ungrateful, or physically threatens the adoptive parents? The legal remedy is to disinherit the child; please read my article “Disinheriting children and descendants, legitimate as well as illegitimate”. What about adoption by spouses where one is a former Filipino citizen and the other is a natural-born citizen of another country? The Supreme Court decided this issue in the case of Republic of the Philippines vs. Toledano G.R. No. 94147 June 8, 1994. This case was decided under the provisions of the Family Code on adoption which have been superseded by RA 8043 and RA 8552. But the point of contention in this case (mandatory joint adoption by both husband and wife under Article 185 of the Family Code) has been carried over to RA 8552, specifically, Section 7. On February 21, 1990, in a verified petition filed before the Regional Trial Court of Iba, Zambales, private respondents spouses Clouse sought to adopt the minor, Solomon Joseph Alcala, the younger brother of private respondent Evelyn A. Clouse. In an Order issued on March 12, 1990, the petition was set for hearing on April 18, 1990. The said Order was published in a newspaper of general circulation in the province of Zambales and City of Olongapo for three (3) consecutive weeks. The principal evidence disclose that private respondent Alvin A. Clouse is a natural born citizen of the United States of America. He married Evelyn, a Filipino on June 4, 1981 at Olongapo City. On August 19, 1988, Evelyn became a naturalized citizen of the United States of America in Guam. They are physically, mentally, morally, and financially capable of adopting Solomon, a twelve (12) year old minor. Since 1981 to 1984, then from November 2, 1989 up to the present, Solomon Joseph Alcala was and has been under the care and custody of private respondents. Solomon gave his consent to the adoption. His mother, Nery Alcala, a widow, likewise consented to the adoption due to poverty and inability to support and educate her son. Mrs. Nila Corazon Pronda, the social worker assigned to conduct the Home and Child Study, favorably recommended the granting of the petition for adoption. WHEREFORE, the Court grants the petition for adoption filed by Spouses Alvin A. Clouse and Evelyn A. Clouse and decrees that the said minor be considered as their child by adoption. To this effect, the Court gives the minor the rights and duties as the legitimate child of the petitioners. Henceforth, he shall be known as SOLOMON ALCALA CLOUSE. The Court dissolves parental authority bestowed upon his natural parents and vests parental authority to the herein petitioners and makes him their legal heir. Pursuant to Article 36 of P.D. 603 as amended, the decree of adoption shall be effective as of the date when the petition was filed. In accordance with Article 53 of the same decree, let this decree of adoption be recorded in the corresponding government agency, particularly the Office of the Local Civil Registrar of Merida, Leyte where the minor was born. The said office of the Local Civil Registrar is hereby directed to issue an amended certificate of live birth to the minor adopted by the petitioners. Let copies of this decision be furnished (sic) the petitioners, DSWD, Zambales Branch, Office of the Solicitor General and the Office of the Local Civil Registrar of Merida, Leyte. The Office of the Solicitor General appealed to the Supreme Court on a pure question of law, that is, under Article 185 of the Family Code, the Clouse couple was not qualified to adopt. Under Articles 184 and 185 of Executive Order (E.O.) No. 209, otherwise known as “The Family Code of the Philippines”, private respondents spouses Clouse are clearly barred from adopting Solomon Joseph Alcala. (c) One who is married to a Filipino citizen and seeks to adopt jointly with his or her spouse a relative by consanguinity of the latter.Aliens not included in the foregoing exceptions may adopt Filipino children in accordance with the rules on inter-country adoption as may be provided by law. There can be no question that private respondent Alvin A. Clouse is not qualified to adopt Solomon Joseph Alcala under any of the exceptional cases in the aforequoted provision. In the first place, he is not a former Filipino citizen but a natural born citizen of the United States of America. In the second place, Solomon Joseph Alcala is neither his relative by consanguinity nor the legitimate child of his spouse. In the third place, when private respondents spouses Clouse jointly filed the petition to adopt Solomon Joseph Alcala on February 21, 1990, private respondent Evelyn A. Clouse was no longer a Filipino citizen. She lost her Filipino citizenship when she was naturalized as a citizen of the United States in 1988. (2) When one spouse seeks to adopt the legitimate child of the other. Article 185 requires a joint adoption by the husband and wife, a condition that must be read along together with Article 184. In sum, the Supreme Court ruled that the adoption must be filed jointly by husband and wife, unless they fall under the exceptions. Also, when adopting jointly, each one of them must be qualified to adopt on his own right. “Relative Adoption” as applies to inter-country adoption refers to the adoption of Filipino child/children by relatives residing abroad within the fourth (4th) degree of consanguity. 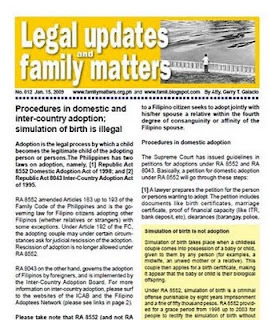 Former Filipinos permanently residing abroad and/or foreigners intending to undertake either local adoption (the filing and the finalization of the adoption is done in the Philippines and have the intention of bringing the adoptive child to their country of residence) or through the inter-country adoption route MUST first secure the approval of the Central Authority on Inter-country Adoption in the country of residence before filing any adoption petition. Adoption applicants from the USA must first secure their suitability and eligibility to adopt (I800A) from the USA Central Authority on Inter-Country Adoption. Canada based adoption applicants obtain such approval from the Central Authority on Inter-country Adoption of the Province or Territory of residence. 1. The Questionnaire for Relative Adoptive Applicants (ICAB Form No.2) which can be downloaded from the ICAB website shall be submitted by the prospective adoptive parents (PAPs) to the Central Authorities (CAs)/ Foreign Adoption Agencies(FAAs). The CAs/FAAs shall endorse to ICAB the completed Questionnaire for Relative Adoptive Applicants (QRAA) with the agency's assessment and recomendation on the prospective adoptive parents. 2. If the CA/FAA favorably recommends the PAPs, the ICAB social worker will then request the CA/FAA to proceed with the preparation of the PAPs’ dossier. On the other hand, based on the significant data on the child as indicated in the QRAA, the assigned ICAB Social Worker will request the DSWD - Field Office (FO) to conduct the Child Study Report with supporting documents. Periodic follow-ups will be made with the DSWD-FO. (The time frame from request to ICAB’s receipt of the report will be 3-6 months. In situations where the FO could not prepare the Child Study Report within the expected time frame in view of heavy adoption caseload, the ICAB social worker will assist in the conduct of the CSR). 3. Once the ICAB receives from the DSWD-FO the child’s dossier and the complete adoption application dossier of the PAPs from the CA or FAA, the ICAB social worker will prepare an executive summary on the case with his/her recommendation on the child’s adoptive placement for the disposition of the Board. The contact list of ICAB counterpart organizations: Asia Pacific, Canada, Europe and USA. Republic Act 9523 “An Act Requiring Certification of the Department of Social Welfare and Development (DSWD) to Declare A Child Legally Available For Adoption as a Prerequisite For Adoption Proceedings” amended certain portions of RA 8552 , RA 8043, and Presidential Decree No. 603 “Child and Youth Welfare Code”. Contrary to erroneous reports in the media and the Internet, RA 9523 did not turn the whole adoption process from a judicial proceeding under the Family Courts to an administrative proceeding under the DSWD. RA 9253 applies only to surrendered, abandoned, neglected, and dependent children who are subject to adoption. Under RA 9523, the time period before a child is considered abandoned has been reduced to a maximum of three months from the original minimum of six months. RA 9523 made the declaration of abandonment of child “administrative in nature” which now requires just a certification signed by the DSWD secretary instead of a judicial order. Because of the new regulations, a child could be declared legally available for adoption in less than two months. Previously, it took as long as three years in court proceedings for such a declaration. Note: You might be interested in reading "Adoption group opposes ‘Orphan’ movie", a Manila Bulletin article by Robert Requintina.